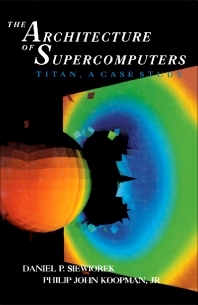 The Architecture of Supercomputers: Titan, A Case Study describes the architecture of the first member of an entirely new computing class, the graphic supercomputing workstation known as Titan. This book is divided into seven chapters. Chapter 1 provides an overview of the Titan architecture, including the motivation, organization, and processes that created it. A survey of all the techniques to speed up computation is presented in Chapter 2. Chapter 3 reviews the issue of particular benchmarks and measures, while Chapter 4 analyzes a model of a concurrency hierarchy extending from the register set to the entire operating system. The architecture of Titan graphics supercomputer and its implementation are considered in Chapter 5. Chapter 6 examines the performance of Titan in terms of the various information flow data rates. The last chapter is devoted to the actual performance on benchmark kernels and how the architecture and implementation affect performance. This publication is recommended for architects and engineers designing processors and systems.